Whether it’s Endoca’s CBD Salve, CBD Body Butter, CBD Pills or CBD Lip Balm, all of their products are second-to-none, and that applies to strength, effect, safety, and of course price. No matter which Endoca product you choose though, there’s no finer CBD for skin products than the Endoca range, and that fact is backed up by literally thousands of positive reviews from verified buyers. Due to being a relatively new health supplement on the market, the wonderful world of CBD can be a tricky one to navigate. There’s quality control, third-party lab reports and that’s not to mention a wide range of different CBD Products to choose from. For those new to CBD, things can get really daunting really fast and that has the potential to put some new users off before they’ve even tried it. Endoca’s story began in Africa when the company owner, originally from Denmark, traveled to help the people of the Zulu region to lengthen their lifespan and improve their quality of life. Much of his time was spent in mobile clinics assisting people with AIDS and other diseases. He noticed that the drugs that were being given to the patients were worsening their conditions and seemed to be offering some nasty side effects. This tragic sight ignited a spark that ultimately led to Endoca being formed, and that’s when they realized that CBD was a natural, effective and safe way of treating a variety of medical conditions. Having studied hard and consulted with professors with an in-depth knowledge of the hemp plant and specifically CBD, Endoca now proudly cultivates 2000 acres of hemp on organic land and have a large factory for processing that complies with the very best pharmaceutical standards. The company employs more than 100 employees, and its goal is to create and sell the best CBD globally at affordable prices and with no compromise on quality. Endoca sells a wide range of great quality CBD Products including CBD Salve, CBD Body Butter, CBD Pills, and CBD Lip Balm, to name but a few. And every product provides the finest quality and most effective CBD available anywhere in the world. Endoca’s CBD Salve is a much-loved product that has customers around the world coming back for more time and time again. This great CBD Salve contains a high concentration of 750 mg of CBD. It’s made with 100% natural, organic and food-grade ingredients and provides instant relief from dry skin and other similar conditions. This salve can be used on the face or body, and hundreds of reviewers have given this one five stars for good reason. Containing CBD, Coconut Oil, and Beeswax, Endoca’s CBD Salve also contains other healthful ingredients like Citrus Medica Limonum, Peel Oil, Citral, Vanilla, and Vitamin E. This CBD Salve provides instant relief from skin irritation, excessive dryness and for broken skin. Endoca also claims this product is an antioxidant, is anti-seborrhoeic and contains anti-aging properties. The salve provides the skin with much-needed lipids and also increases the moisture content in the skin. This product can also be used for dry lips, dry elbows, and cracked heels. For those who like the finer things in life, Endoca’s Hemp Whipped CBD Body Butter contains a whopping 1500 mg of best CBD extract and feels like pure heaven on the skin. Used as a luxurious, protective and moisturizing cream on the body, this body butter also contains other healthy ingredients in the mix, including root starch, coconut oil, and Vitamin E. One 100 ml container will also go a long way as only a tiny amount is required at a time. The Shea Butter inside this CBD Body Butter also leaves the skin feeling silky smooth and soft throughout the day. Endoca proudly controls all of their CBD Products from seed to shelf. That means that they have a hand in every part of the delicate process of extracting CBD – from growing the Hemp to mixing the other ingredients. They also provide third-party lab results for their full range, which are available in a transparent way on their website. This Hemp Whipped Body Butter also has many genuine reviews from satisfied customers who enjoyed the product and is well worth taking a closer look at. Endoca’s CBD Pills are another great product that is loved by many. For people wanting to take their CBD orally and to ingest it, Endoca’s Raw Hemp Oil Capsules contain a generous 50 mg of finest CBD per dose and come in bottles of 1500 mg CBD total. Terpenes compliment Phytocannabinoids like CBD and CBDa present in the cannabis plant. They include Myrcene, Limonene, Alpha & Beta-pinene, Linalool, B-caryophyllene, and Caryophyllene oxide; all of which encourage the renowned “Entourage Effect,” whereby the combination of the CBD along with the Terpenes gives a more rounded, full-bodied effect. 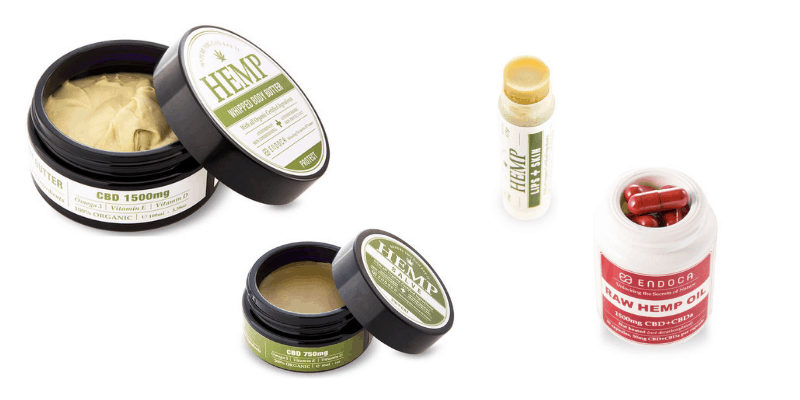 The other great thing about these Hemp Oil Capsules is that as plant waxes are not removed on purpose, the oil’s texture inside is thick, as well as highly concentrated. For many people, keeping lips moist and healthy is a daily challenge. Many lip balms on the market these days contain some nasty chemicals, and while they offer temporary relief from chapped lips, they can have adverse long-term effects for some. Endoca’s CBD Lips lip balm contains 20 mg of finest CBD and is made with totally natural and organic ingredients. It protects lips and skin and is also THC-free. The coconut oil and vitamin E in the mix is also a great addition as it leaves lips feeling moist and refreshed every time it’s applied. The organic Hemp Oil inside this product is rich in omega 6 and 3 fatty acids which also rejuvenates dry lips and other sensitive areas on the face and neck. Top-shelf Vanilla extract, Limonene, and Honey make this the perfect solution for those wanting an all-natural and healthy lip balm for daily use. When it comes to buying CBD, you can’t go wrong with products from a company like Endoca. Their attention to detail and robust processing procedures mean you can rest assured you are getting the best quality and safe CBD Extract anywhere in the world. Whether it’s Endoca’s CBD Salve, CBD Body Butter, CBD Pills or CBD Lip Balm, all of their products are second-to-none, and that applies to strength, effect, safety, and of course price. No matter which Endoca product you choose though, there’s no finer CBD for skin products than the Endoca range, and that fact is backed up by literally thousands of positive reviews from verified buyers. The fact that Endoca backs up all of their fantastic CBD Products with third-party lab results also takes any doubts or guesswork out for you. They spend serious money ensuring their CBD is the best quality, most effective and safest anywhere on the market. You can also benefit from a great price point across the full range of Endoca products and be sure to look out for CBD Coupon Codes that come online from time to time. When it comes to CBD, look no further than Endoca for the very best products in the industry.